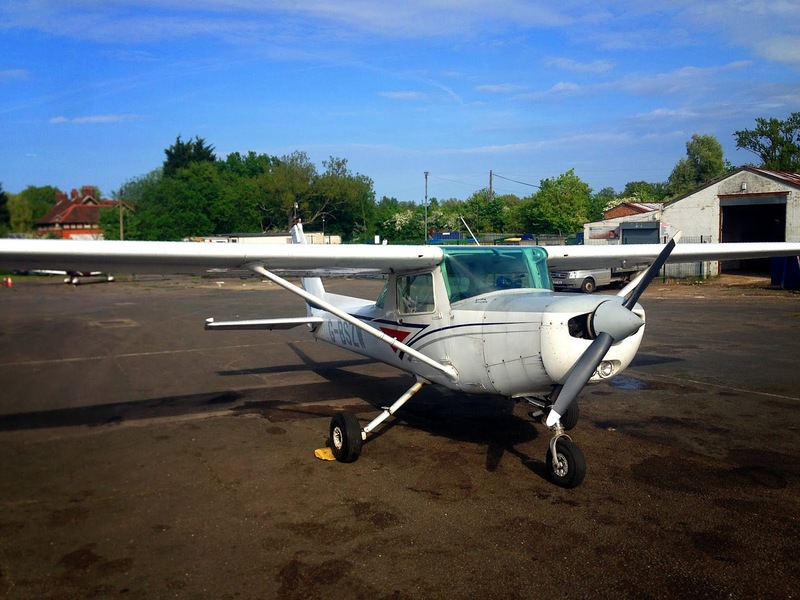 Elstree is a challenging place to learn to fly, and remains that way even for experienced pilots who have been based there a number of years. 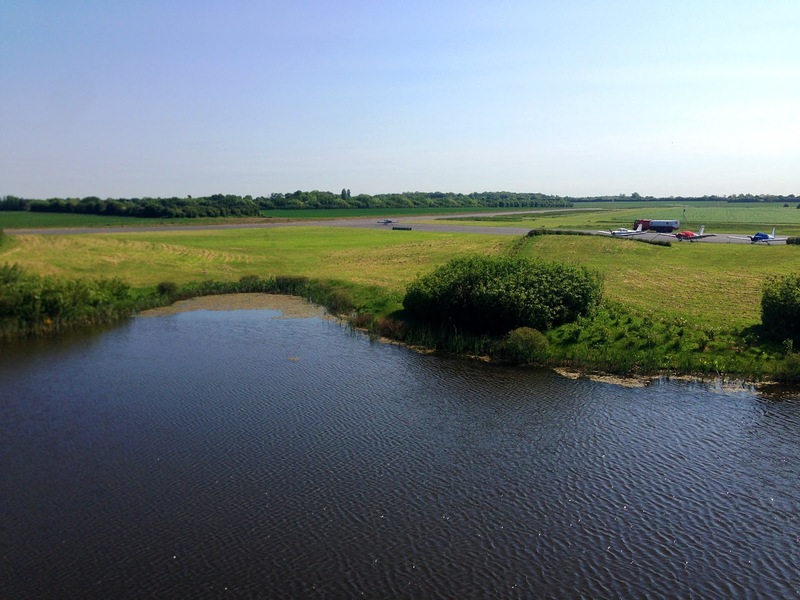 The airfield sees a diversity of use, from helicopter tours of nearby London to various types of aerial survey work and aircraft maintenance. It also provides a stopping point for many privately owned planes; it's possible to see everything from classic museum pieces to shiny, luxurious tourers flying in and out over a single day. Its compact, somewhat uneven runway is bordered by tall trees on the eastern end, and the noticeable slope encourages you to touch down and get on the brakes as early as possible when landing from the west. The surrounding air corridor can also feel claustrophobic due to the close proximity of major hubs like Heathrow and Luton, not to mention the ceiling of heavily controlled airspace just a few thousand feet above. Despite its often demanding nature, the airfield's location and accessibility have been ideal for me while living in and around London, and I've had many an hour to get used to the local scenery. 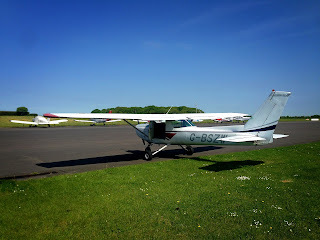 Having not flown with any regularity for the past two or three months, I decided to get back into practice by taking a Cessna 152 for a solo trip to the slightly more forgiving Turweston airfield, around forty miles north-west. I was scheduled to leave at nine o'clock on a Tuesday morning, with the aim of avoiding peak times for training flights at Elstree while also having to dodge less en-route traffic once I was airborne. Furthermore, there was a variable and sometimes gusty wind blowing across the runway, whose intensity was expected to ramp up later in the afternoon. There was almost no activity when I arrived. The sunlight filtered through a very thin layer of cloud sitting around four thousand feet above ground, and the outside temperature was gradually climbing as I walked across the tarmac to check over my aircraft. 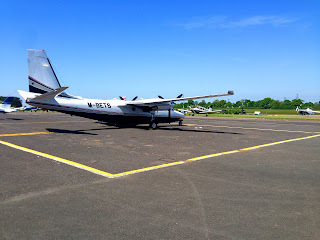 While I went through the motions, the morning silence was broken by the sound of one of the more eye-catching planes parked along the apron as its engine spooled up. I hadn't noticed anyone climb into the six-seat, high-performance Cessna 210 in front of the control tower, but there was no mistaking the powerful whine of its 450-horsepower turboprop as it nosed along the empty taxiways, lined up on the western end of the runway and rocketed out towards the still-rising sun. Once I was happy that my aircraft was prepped to fly, I climbed in, got comfortable and fired up the engine. It started straight away, and after a minute or two of warming up, the four-cylinder powerplant was idling smoothly. This meant I was ready to begin my taxi. 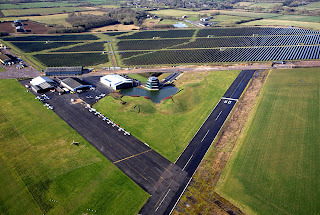 The tower confirmed that I'd be departing from the east-facing end of Elstree's single runway. I threaded between the surrounding rows of parked aircraft and made my way along the bumpy grass surface to get to the holding point, where I ran through my final power checks. The tower prompted that there was no inbound traffic, so I pulled out onto the centre-line and squeezed in the power. The airspeed indicator twisted clockwise as I gathered momentum. The small plane seemed to get lighter and lighter with every passing second, until I eventually raised the nose towards the sky and felt the rough surface of the runway disappear beneath me. A few seconds later, I had cleared the looming trees at the end of the airfield's perimeter and was free to make a shallow turn to the north. As I continued to gain height, I glanced back through the left window. Just minutes earlier, the huge hangars and wide, paved surfaces had dominated the view on the ground. Now they looked like tiny props placed between the trees and fields of a rolling, expansive landscape model; inconsequential when seen even in a slightly bigger picture. This very rapid change of perspective is one of the parts of flying that will never get old. The M25 motorway came next, its gray surface weaving through the countryside to eventually encircle all of London. The last of the morning commuters were crawling along the road in both directions, their cars appearing as tiny coloured specks when they passed in groups beneath the right wing. I levelled off just above two thousand feet, brought the power back for a comfortable cruise speed and followed the motorway round to the west. By now I had tuned the radio to talk to a controller at Farnborough, who would warn me of any conflicting traffic they could see on radar. The frequency was unusually quiet at this time in the morning, which I took to be a positive sign. Scanning the hazy horizon around the nose confirmed that I was largely alone for now; a rarity in the constricted tunnel of activity between the largest airports in the south of England. The last tendrils of urban development eventually trailed off, and before long the view was almost entirely green as I found myself cruising over the Chiltern Hills. The verdant shades were highlighted in places by fields of bright yellow, and the endless areas of farmland were separated by crooked hedges of even deeper greens and browns. The land eventually reached a steep drop-off where the hills descended a few hundred feet before flattening out towards Aylesbury and Oxford. After a quick scan of the blue sky above me, I brought the engine back up to full power and started to climb again. I was now sufficiently far from London that the invisible barrier of controlled airspace was no longer right overhead, so I wanted to take the opportunity to gain another thousand feet in search of slightly smoother air. Beautiful though the lush hills below me were, they generated unpredictable and turbulent currents which made the lower altitudes a little too bumpy for a relaxing, 'hands-off' cruise. When I levelled off a few minutes later at three thousand feet, I was able to point the nose further north, trim the pressure from the controls and fine-tune the engine power such that I could focus more on appreciating the view than having to keep the plane in check. From here, it was a straight line to Turweston. What little cloud there was when I departed had now burned off as the outside temperature continued to rise. Apart from a few loose flocks of birds and the occasional aircraft dipping its wings as it slid past in the opposite direction, the sky was uniform and clear. After ten minutes of travelling north, I was handed off by the Farnborough controller and told to contact the next station on my route. I was now only seven or eight miles from my destination, so I re-tuned my radio to their tower frequency and listened for any traffic. Again, the silence told me I was probably alone and free to make an approach without getting in anyone's way. 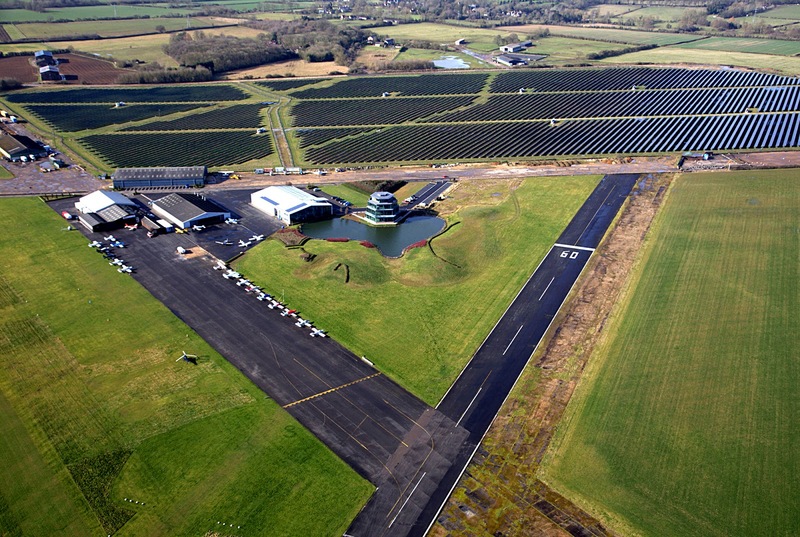 Turweston is just a few miles south-west of the Silverstone racetrack, and this huge venue makes a perfect reference point when looking for the airport. I overflew the runway at two thousand feet before banking right and beginning my descent for an overhead join into the circuit. I was surprised to see cars racing up and down the runway as I aligned myself with the traffic pattern. Perhaps the airfield's close proximity to Silverstone meant that their straight, smooth stretch of runway had a second use as a testing ground for racing teams? There was nothing on the radio to suggest that they knew I was coming in to land, but I continued my approach and was sure to give the tower regular updates as I moved around above the runway. By the time I turned to face down the centre-line, the tarmac was indeed clear and I gave myself the go-ahead to descend the final few hundred feet and land. A minute later, I was rolling out towards the parking spaces in front of the airport's main multi-storey glass building. After checking in with the controller on the top floor, I grabbed a drink and sat out on the east facing terrace to absorb some mid-morning sun. The cars I had seen during my descent had resumed their use of the runway, and were driving back and forth along its length. It was difficult to work out exactly what they were doing, as they would alternate between sudden bursts of noisy acceleration and heavy braking which caused the exhausts to backfire and the tires to squeal. As soon as they came to a stop, they would shoot off again until they reached the far end of the runway, where they turned and repeated their run in the opposite direction. They would occasionally vacate the runway as another aircraft made its final approach, but overall the air traffic at Turweston remained light. I spent little more than an hour on the ground before the time came for me to return the Cessna to Elstree, ready for the next pilot. Midday was now approaching, and activity was finally ramping up among the other aircraft dotted around the field. By the time I started the engine and pulled forward to begin my taxi, there were at least two other planes slotting behind me in the queue for departure. With the winds gradually picking up, I lost no time getting back into the air, turning south and climbing up into the calmer skies at three thousand feet. After re-establishing contact with the Farnborough controller for traffic warnings, the return cruise was straight-forward, and felt a lot quicker with the assistance of the increasing tailwind. As I once again passed over the creased boundary of the Chiltern Hills, it became obvious that I was sharing the skies with many other pilots this time round. Helicopters whizzed past at a range of different altitudes; some heading towards the urban centre of London while others seemed to be hanging in place a few hundred feet above ground level. The radio was alive with the constant exchange of advice and acknowledgements as the controller expertly managed the changing ensemble of air traffic. With my leisurely and predictable course to the east, I was thankfully able to avoid close conflicts before any warning was necessary. It took only a few minutes of straight-and-level flight between Luton and London until the familiar, meandering channel of the M25 re-appeared on the nose. 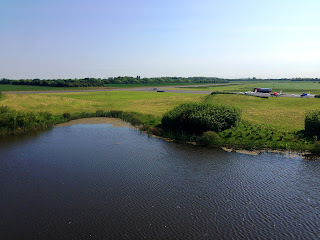 From here, little searching was needed to pick out the dark surfaces of the twin reservoirs adjacent to Elstree airfield. I exchanged a few further words with the Farnborough controller, before tuning back to the familiar home frequency and gathering the info I needed to begin my approach and landing. The winds were getting stronger here too, with a ten knot breeze blowing almost straight across the runway. This made the final approach a little more challenging, especially as the tall trees either side created the odd arbitrary air current, but it wasn't long before my wheels squeaked down onto solid ground. The short trip between Elstree and Turweston was a perfect way to log a valuable hour and a half in the air, while also making sure my skills hadn't waned after an interval without practice. The familiarity of the scenery, combined with the largely empty skies on departure, made sure that the journey was refreshing and enjoyable. This was my first actual landing at Turweston too, so there was the added satisfaction of ticking another new place off my long list. Leaving early in the morning meant I'd managed to make it there and back before midday, which left the entire afternoon to enjoy the weather while contemplating where my next flight of the summer might take me.